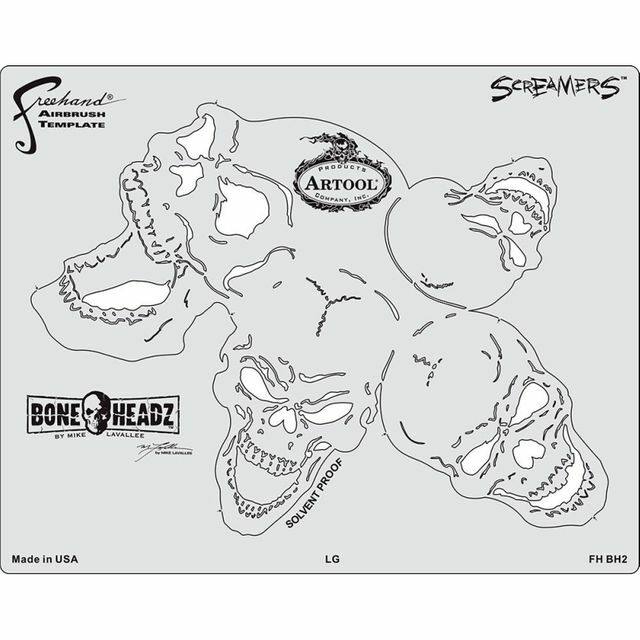 The new Artool BONEHEADZ Freehand Airbrush Templates designed by Mike Lavallee is fresh from the grave. Fasten your seat belts, the raising the dead just got horrific! For a few years the world of kustom painting hasn’t been the same since the creation of Mike’s True Fire ® airbrushing techniques. Now Mike turns up the heat a few notches with his outrageous skull offerings, which are sure win over the hearts ‘n souls of kustom auto painters everywhere. They’ll save you a ton of time in creating something completely wicked for your rod or chopper. There are two sets of BONEHEADZ to choose from, which contain 4 sizes in SM through XLG: CRANIUM (FH BH 1), SCREAMERS (FH BH 2) and EIGHT8DEAD (FH BH 3). These realistic skulls highlight a myriad of angles, sizes and looks for any skullicious project you can conjure up!